The Souls games have been a series since the dawn of Demon Souls in 2009. Since then Dark Souls, Dark Souls 2 and its expansions, and Bloodborne have been released (and we eagerly waiting for Dark Souls 3). All with similar gameplay styles, immeasurable amounts of lore, and kill-self levels of frustration. They have become enormously popular in the more recent years, due almost entirely to its die-hard fan base, which have been sustaining the life-blood of the games by promoting them through all social mediums. (Owed entirely to the fact that From Software does little-to-nothing in the area of advertising for themselves.) However, these games don’t have the best reputation as they are described as being “the most difficult games you will evar play!” But still you will find countless forums, websites, lets-plays, and other fandom all over the internet and YouTube dedicated to these games. Why is that? And why should you, or anyone for that matter play a Souls game? Allow me, if I may, to tell you why. Let us first begin with the lore. In the Souls games, players are not introduced to lore in the traditional sense of being “fed” information. There’s usually just one little monologue at the beginning of each, where some NPC tells you to go complete “the impossible task.” In Dark Souls, it’s ringing the Two Bells of Awakening which are on the opposite ends of the world guarded by massive demons. In Bloodborne, it’s curing the beast-blood disease that pretty much wiped out the population. And that’s all the information you’re going to get. So you have very little information to go on, and are sent aimlessly wandering on a quest that you’re not entirely sure why you are a part of. But you know one thing is for sure: gotta kill stuff! So off you go, cutting down enemies, opening doors, and finding hidden treasures. Then you look at your loot, and realize each piece comes with a paragraph of descriptor-font. Then you realize that every item in the game has their own individual story, which ties in with the main story of the game. Telling you very general (and sometimes cryptic) things about the past, the present, and everything in between. This makes it so that you have to piece the storyline together yourself, make your own inferences about the story, and build the lore in your mind’s-eye. This is exactly how the director envisioned it, because as a boy, he liked reading European novels about knights and dragons, but couldn’t read English well. So he just read what he could, and pieced the story together from there. The Souls games have been constructed on this foundation, and are completely unique in this way. Now let’s move onto game design and controls. As previously stated, the player is thrusted into a world they know nothing about, and are not truly giving a set direction. From most of the starting locations in the Souls games, you can choose where you want to go first. The player will certainly find that enemies in any of the directions do massive damage to the player, but some die easier than others. So choose the path of least resistance, and begin you journey. Now as a new player, it makes it an easy decision for you in terms of choosing your path. But an experienced player, may want to take a more difficult path first, because the rewards yielded will help them progress through the game more quickly. Nonetheless all of the enemies have a high potential to kill you, if you’re not on-guard for even a second. The skill required to kill just one “regular enemy” becomes exponentially increased when having to kill three of them simultaneously. So players have to really be on-point for the entirety of the play-through. The controls in the games usually allow the player to be very proactive in their attacks and dodging, while still being able to maintain a defense while assessing enemy attack patterns. 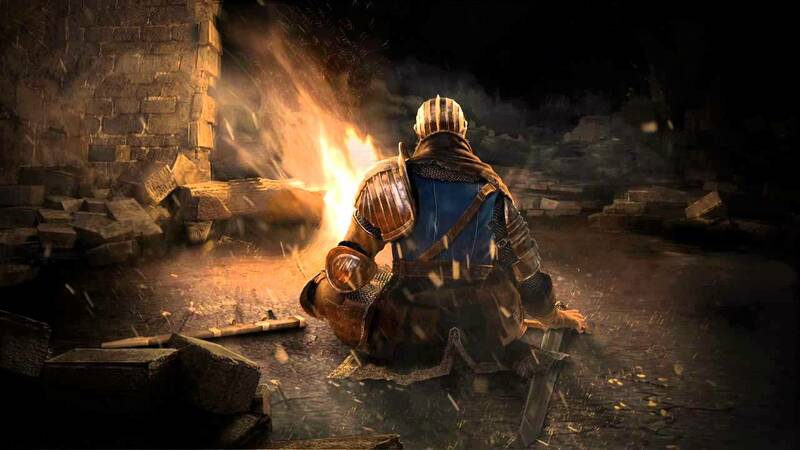 The Souls games can feel a little slow, in terms of the character’s movements and abilities, but it was designed in this way to make the player’s decision mean that much more. This is because the game auto-saves at every interval, making each decision you make, a final decision. Speaking of good and bad decision making, let’s discuss the “punishment-high” effect of the Souls games. I believe that it’s one of the most unique aspects of the games, which brings players back for more and more… just like the good little masochists they are. Everything in these games is designed to kill you… from the enemies, to the booby-traps in the environment, to your own miss-steps that send you plunging to your doom. It’s really frustrating. The level up systems in the Souls games are also to blame for player frustration. If you want to level up you need souls/blood/etc., which means killing stuff. So you go out to kill stuff, accumulate a whole bunch of level up juice, and then… die. Well now your level up juice is in a pile where you died, and you have to start from the beginning of the level again, with all of the enemies respawned in your path. If you reach them congrats! If you don’t, they are lost to the void for all eternity. That’s all included with the boss fights along the way. Some of the bosses seem completely unbeatable, and will literally wipe the floor with your corpse, desecrate it, and mock you. The fierce battle the player has to go through just to get to the boss is crazy enough, just to be met with a foe that crushes you mercilessly… but this is all part of the process. The game is difficult, and it makes it difficult for you to complete tasks, but there is no necessity to grind for experience. The secret is to test things out, find enemy weak points, be patient, and learn your foe – in the gaming world this is stated simply as: git gud (get good). There are suitable strategies for every situation, and it is your job to find them. Now you may be asking, where does the “high” portion of the punishment come into play? Well… after facing all of the adversity, the impossible odds, the countless deaths, and the demining failures, you will ultimately overcome it. You will defeat the boss with sheer determination, and accomplish what was once thought impossible. In that moment of victory, you will feel a high unlike any other. Filled with joy, content, and achievement… and you know that it was all because of you. It was every little decision you made in that battle. It was all the hard work leading up to it. And when that high hits you, man I hope you’re sitting down for it, cause it’s a really big wave. I think that the desire to move forward in the game spawns from this, even after the player is punished relentlessly countless times. In the end, the Souls games tell beautifully tragic stories, while creating a world around the player that just begs to be explored. All of the levels and areas are connected either physically or figuratively, and the creatures are as enigmatic as the world around them. The characters are sure to make an impact on you, and are undeniably unforgettable (for better or worse). The Souls games are full of wonders, frustration, and excitement, of which no other game I have ever played has been able to match. Why play a Souls game? Because it’s the greatest experience you can have playing a video game, if you appreciate the games for what they are, and especially for what they do to you.